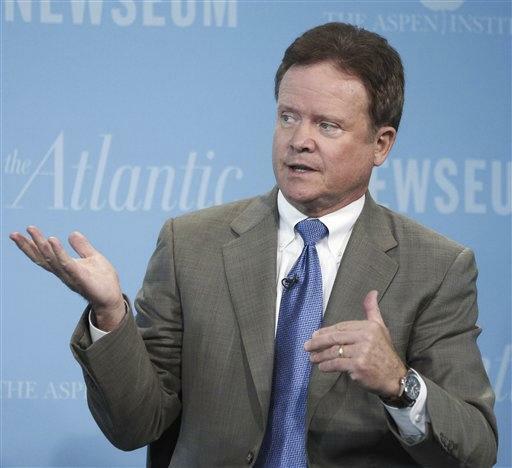 RICHMOND, Va. (AP) - Freshman Democratic Sen. Jim Webb of Virginia announced Wednesday he will retire when his term ends next year, deepening the challenge to his party as it struggles to maintain a Senate majority in the 2012 elections. In an e-mail announcement, the 65-year-old former Navy secretary said that after much thought, he had decided to return to the private sector. He offered no additional details about his plans but said he has "every intention of remaining involved" in national issues. The announcement leaves Democrats scrambling to field a strong candidate in a Southern state that has alternated between Democratic and Republican control in recent years. In 2006, Webb narrowly won the seat by about 9,000 votes over incumbent Republican George Allen. Allen, also a former governor, is running for his old seat, along with others. With Democrats now clinging to a narrow majority in the Senate and struggling since President Barack Obama's 2008 win, the Virginia race could play a key role in who winds up controlling Congress. Webb's military credentials and conservative background - he is a Vietnam veteran who served as Navy secretary under President Ronald Reagan - made him a formidable incumbent. The question now is whether Democrats can find a strong replacement. "Webb was going to face a tough race, but still he was an incumbent," said James Ceaser, a political scientist at the University of Virginia who said Webb's decision makes things difficult for Democrats. "He was a good fit for the state, for a Democrat ... he had a good ol' boy appeal, partly because of his military background." Republicans pounced on Webb's announcement as a sign of Democratic weakness in the state. Virginia state GOP Chairman Pat Mullins said Webb's announcement "couldn't be worse news for the Democrats." "Instead of facing the most hotly contested Senate race in the country with the advantages of incumbency, they must deal with a nomination contest and then face a Republican candidate in the fall in a state that has overwhelming rejected nearly every Democrat since President Obama was sworn into office," Mullins said. Democrats insisted they have a strong chance of holding the seat. Some held out hope that Tim Kaine, a former Virginia governor and current chairman of the Democratic National Committee, would step into the void. Kaine, who issued a statement Wednesday touting the party's strength in the state, has said previously that he is not interested in running, but some Democrats said that might have been in deference to Webb. "I would hope he would be seriously considering it," said Rep. James Moran, a northern Virginia Democrat. "I think a ticket of Obama and Kaine would be quite a strong ticket in 2012." Kaine, who is close to Obama, did not indicate in his statement if he would seek the seat and he did not return a telephone request from The Associated Press for comment. Barring any future moves or appointments, Webb's retirement would mark an anticlimactic finish to a once-promising political career. Early on, Webb was seen as a potential star for his party - a new breed of Southern Democrat who could stretch the party's appeal by connecting with conservative voters. But his Senate career has been largely quiet. Webb took more of a behind-the-scenes approach and never emerged as a major political force, even as he remained popular in Virginia. Webb was elected in 2006 after Allen, a rising Republican star eyeing a potential White House, stumbled badly in 2006 by calling a Webb campaign volunteer of Indian ancestry a "macaca," a term some cultures consider an ethnic disparagement. Posted on YouTube, video of the comment became an online hit and was grist for news reports and television comedians for weeks. Two years later, Obama won Virginia, carrying a state that had traditionally backed Republican presidential nominees even as it elected Democratic and Republican governors. But in 2009, the state flipped again, and Republican Gov. Bob McDonnell won the office in a landslide. Last year, the GOP defeated three Democratic incumbents in congressional races. Obama spoke to Webb by telephone on Wednesday and the president thanked him for serving the country, White House press secretary Robert Gibbs said. The president also issued a statement praising Webb. "From his courageous service in Vietnam to his tireless work in the United States Senate, Jim Webb has dedicated his life to serving our nation and those who defend it," Obama said, citing Webb's efforts to pass a post-9/11 GI Bill as well as his work on Southeast Asia and criminal justice reform. In a statement Wednesday, Allen, the son of the late Washington Redskins coach George Allen, said he did not enter the race to run against any one person and his campaign will continue to focus on achievable reforms. Allen faces primary opposition, and tea party activists have become more of a force in the GOP since he left office. Virginia tea party leader Jamie Radtke has declared her candidacy and conservative Del. Bob Marshall, who finished a close second in his bid for the Senate GOP nomination in 2008, is angling toward another race next year. Webb is the fourth senator to announce plans to retire. The others are Kent Conrad, D-N.D., Kay Bailey Hutchison, R-Texas, and Joseph Lieberman, I-Conn.
Democrats, with a 53-47 majority, must defend 23 Senate seats next year, including two held by independents. Many are in swing states where Republicans hope to mount strong challenges. By contrast, only 10 GOP-held seats will be on the ballot. "We are a state people are going to watch, and the White House is going to be very interested in how this race plays out," said former Democratic Gov. L. Douglas Wilder, noting that the Democratic nominee and Obama will be running at the same time. "It's very important they coalesce. Whoever is running for the Senate and president have to be a team." George Mason University political scientist Mark Rozell said Webb's announcement "upends the political landscape in Virginia." He said party leaders might press Kaine to run because of his name recognition, but that he's not sure the low-key Kaine would be "terribly comfortable" in such a Senate race. Webb's decision was not a complete surprise, as he had done little fundraising. Since taking office, Webb has focused much of his energy on international issues. Ceaser, the UVa political scientist, said Webb simply might not have had the "fire in the belly" needed for a national political career. And he said Webb might also have been discouraged by the political difficulties that Virginia Democrats faced in 2010. Moran said the notoriously clubby and deliberative Senate might simply have not been a good fit for Webb. "I think he enjoys getting things done, and I don't think he's a natural-born politician, although he's clearly a leader," Moran said. "He hasn't told me that, he's not one to complain, but he's not a natural backslapper ... and I don't think he gets a great deal of joy out of raising money." Dave "Mudcat" Saunders, a campaign strategist for Webb and other conservative Democrats, said he believed Webb felt "shackled" by the U.S. Senate. "I think with his writings, the artistic Jim Webb could easily do more to help forward the causes of economic fairness and social justice out here in the real world rather than (inside) the beltway," Saunders said. Webb is the author of six best-selling military suspense novels and "Born Fighting," a nonfiction book published in 2004. A Naval Academy graduate, Webb was a combat Marine in Vietnam before serving as a lawyer, congressional aide and a published author. Evans and AP Special Correspondent David Espo in Washington, and Associated Press writers Dena Potter, Larry O'Dell and Steve Szkotak in Richmond contributed to this report.